An international conference ‘Syria: A Way to Peace’ took place on June 3, 2013, in Geneva, on the margins of the 23d session of the UN Council of Human Right. It was attended by Bishop Isaac of Alameya, representative of Patriarch John X of Antioch and All the East, UN High Commissioner for Human Rights Mr. Navanethem Pillay, Archpriest Mikhail Gundyaev, Russian Orthodox Church representative at the World Council of Churches and international organizations in Geneva, and other public and religious figures and diplomats. Among the organizers of the conference was the Imperial Orthodox Palestinian Society, which was represented at the forum by Ms. Ye. Agapova, IOPS deputy chair. Among the participants was Ms. N. Narochinskaya, leader of the Historical Perspective Foundation and member of the IOPS board. The conference heard a message brought from the Supreme Mufti of Syria, Ahmad Badr Al-Din Hassoun, who could not attend for security reasons. In his message, he informed the meeting about brutal executions of civilians carried out by the militants, the destruction of churches and mosques they perpetrated. The mufti called upon the UN Council of Human rights to show an unbiased and objective approach to the developments in Syria. Bishop Isaac spoke about the situation of Christians in Syria, expressing deep concern over their mass exodus from their native land, the cases of priests taken prisoner, acts of vandalism and destruction of Christian shrines. He made a special mention of the positive role played by Russia in overcoming the crisis. The bishop emphasized that Christians feel themselves an integral part of the Syrian society. Archpriest Mikhail Gundyaev, in his remarks, stated that what was actually going on in Syria was a gradual loss of one of the unique models of peaceful and mutually respectful coexistence between Christians and Muslims. He also expressed special concern for the fate of two missing hierarchs – Metropolitan Paul of Aleppo and Metropolitan Mar Gregorios Ibrahim whom militants had taken prisoners on April 22, 2013, in the vicinity of Aleppo. The conference resolved that an appeal be sent to the UN Council of Human Rights to express deep concern over the capture of clergy and to call upon the UN to exert every effort to set Syrian metropolitans free from captivity. 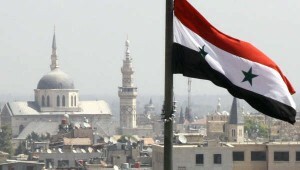 The delegates agreed that a peaceful settlement should be reached on the basis of the Geneva Communique through inter-Syrian national dialogue so that the Syrian themselves could settle their problems and create a situation in which all Syrians regardless of their ethnic or confessional background or political views could feel safe.